After eating a meal, working out, or even after performing routine activities, do you immediately grab a sports drink or a soda? These beverages are typically acidic and contain large amounts of sugar, leading to tooth decay. Even some fruit juices are packed with decay-causing sugar. Acids and sugars damage tooth enamel. Enamel is the outer surface of the tooth that helps protect them from an ordinary day’s use. Once damage is caused to enamel, the damage is irreversible. Before you turn to sports drinks and sodas for hydration, consider reaching for a glass of water! Staying hydrated, especially in the warm weather months, is essential for your overall health. Since water makes up more than half of your body weight, it is needed for proper function of tissues and organs, as well as for survival. Without water, your blood pressure, body temperature, and metabolism are at risk! A deficiency in body water can lead to dehydration and negative physical and psychological changes in your body. Those involved in sports, or have certain medical conditions are at a higher risk of dehydration and should consume greater amounts of water. Did you know that staying hydrated also helps your mouth? Hydration is particularly important in maintaining good oral health. Dehydration can lead to halitosis, dry mouth, gum disease, and possibly even heart disease! Drinking water will help increase your levels of bacteria-fighting saliva, and ultimately help reduce your chances of developing these common oral health problems. Along with brushing and flossing, drinking an adequate amount of water will help wash away bacteria in your mouth. 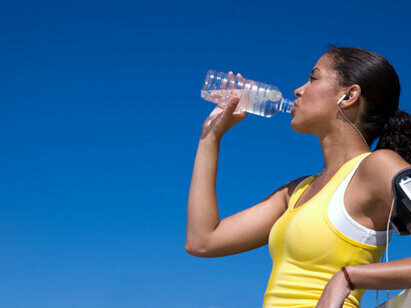 The recommended daily intake of water for women is about 8 cups, and roughly 13 cups for men. Even though water is often the best option for staying hydrated, a glass of milk can also be a good beverage for replenishing energy after a day of hard work. Try carrying a reusable water bottle around with you during the day. If you find water to be too plain, consider adding a slice of lemon. Make sure to drink water before, during and after your exercise. Order water when dining out. It’s not only healthy, but also free! Try drinking water with each meal or snack to help make it a routine.